The history of the Self-Arisen Avalokiteshvara Brothers begins with Avalokiteshvara sending and concealing sacred Avalokiteshvara images throughout our world as to benefit beings of this degenerate age. In the 7th century came King Songtsen Gampo (c.605-650) as an emanation of Avalokiteshvara to establish the dharma within Tibet. Well aware of the power of these unique and sacred treasure items, Songtsen Gampo sought to bring such a statue of Avalokiteshvara to Tibet to bless the land and people and to lay the ground for the establishment of the dharma. Songtsen Gampo radiated forth a light ray from between his eyebrows, at the tip of which he sent an emanation—the monk Akaramatishla (Skt. Akaramatiśīla)—to identify a Haricandana tree in the thick of a sandalwood forest somewhere in the Nepalese Therai and later to gently to extract from it the Self-Arisen Avalokiteshvara Brothers. During the extraction the statues miraculously spoke and determined the place of their future residences, choosing the locations where they are now located. Decleer, Hubert. 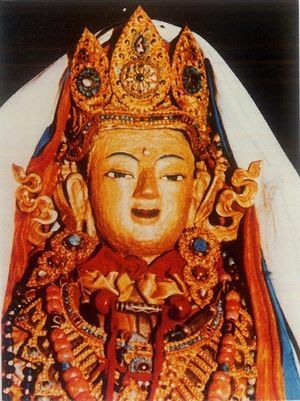 “The Sacred Wati Image and Temple in Kyirong – Franz-Karl Erhard's Magisterial Magnum Opus.” The Tibet Journal XXXI.3, 2006: 76-116. Decleer, Hubert. “Another Newar Link with Suratabajra & Lhasa’s White Crystal Cave? Zhigpo-lingpa’s Meditation Scenario on the Five Arya Brother Images.” The Great Compassion: International Buddhist Review, 1, 2004, 53-8. Ehrhard, Franz Karl. Die Statue und der Tempel des Arya Va-ti bzang-po: Ein Beitrag zur Geschichte und Geographie des Tibetischen Buddhismus (= Contributions to Tibetan Studies, 2). Wiesbaden: Dr. Ludwig Reichert Verlag, 2004. Sørensen, Per K. Tibetan Buddhist Historiography: The Mirror Illuminating the Royal Genealogies: An Annotated Translation of the XIVth Century Chronicle rGyal-rabs gsal-ba'i me-long. Asiatische Forschungen Band 128. Wiesbaden: Harrassowitz Verlag, 1994. Sørensen, Per K. “Restless Relic. The Arya Lokeśvara Icon: Symbol of Power, Legitimacy, and Pawn for Patronage.” In B. Kellner ed., Pramanakirtih: Papers Dedicated to Ernst Steinkellner on the Occasion of his 70th Birthday. Vol. II. Wien: WSTB, 2007, 857-885. ↑ There are several similar stories recounting the statues origin. One of their main differences is the number of sacred Avalokiteshvara mentioned. In the three statue story, statues one to three are included. In the four and five statue stories, the fourth and fifth statues are added respectively (see the list below). For a short discussion, see: Hubert Decleer, “The Sacred Wati Image and Temple in Kyirong – Franz-Karl Erhard's Magisterial Magnum Opus,” The Tibet Journal XXXI.3, 2006, 78-80. ↑ Arya Vati Zangpo’s original location was the Jamtrin Lhakhang, one of the border taming temples built by king Songtsen Gampo (28°25'00.0"N 85°16'60.0"E). The statue has been moved to Dharamasala, where it remains in the possession of His Holiness the Dalai Lama (32°13'56.8"N 76°19'28.2"E). ↑ Arya Bukham resides for half of the year in Patan (27°40'13.2"N 85°19'22.3"E) and for the other half of the year in Bungamati (27°37'46.7"N 85°18'07.8"E). ↑ A special type of sandalwood tree. ↑ For a summary of the story see: Hubert Decleer, “The Sacred Wati Image and Temple in Kyirong – Franz-Karl Erhard's Magisterial Magnum Opus,” The Tibet Journal XXXI.3, 2006. See also: Per K. Sørensen, Tibetan Buddhist Historiography: The Mirror Illuminating the Royal Genealogies: An Annotated Translation of the XIVth Century Chronicle rGyal-rabs gsal-ba'i me-long, (Wiesbaden: Harrassowitz Verlag, 1994) 189-194. For an extensive discussion of the various stories, see: Franz Karl Ehrhard, Die Statue und der Tempel des Arya Va-ti bzang-po: Ein Beitrag zur Geschichte und Geographie des Tibetischen Buddhismus, (Wiesbaden: Dr. Ludwig Reichert Verlag, 2004).